Phytosterols or plant sterols are naturally occurring compounds that are found in the cell membranes of plants. Phytosterols are present in cereals, nuts, and vegetables. Commercially, they are obtained from vegetable oils and tall oils. Vegetable oils such as soybean oil, rapeseed oils, sunflower oil, and corn oil contain phytosterols. Increase in the prevalence of cardiovascular diseases across the globe is estimated to drive the demand for sterols during the forecast period. Phytosterols reduce cholesterol absorption, due to their structural resemblance with cholesterol. They are beneficial for human health and thus, they are used in several products such as milk, yogurt, spreads, and margarine. Rise in the prevalence of cardiovascular diseases is boosting the consumption of phytosterols. Europe is a dominant region of the global sterols market. Every year, cardiovascular diseases (CVDs) cause 3.9 million deaths in the region and over 1.8 million deaths in the European Union (EU). Plant sterols i.e. phytosterols are naturally occurring compounds derived from vegetable oils and tall oils. Phytosterols are similar in structure to human cholesterol. All foods containing vegetable fats (for example, nuts, seeds, cereals, and beans, and products manufactured from them) also contain plant sterols in small amounts. Phytosterols are primarily used in dietary supplements and foods, such as liquid and oil-based supplements, as well as in shots and soft-gelatin capsules, instant powders, and chewable, swallow-able and effervescent supplements. Phytosterols are also used in dairy products such as milk, juices, desserts, yogurt, cake-filling creams, ice creams, and mousses. Phytosterols are also employed in baked goods, biscuits, cookies, cakes, and yeast-raised baked goods. Enrichment of foods such as margarine, cheese, butter, yogurt, condensed milk, and cream with phytosterol esters has been an important development in functional foods to enhance the cholesterol-lowering ability of traditional food products. Thus, rise in the demand for various kinds of foods such as bakery products, dairy products, supplements, and beverages is augmenting the demand for phytosterols. Based on raw material, the sterols market can be classified into vegetable oil and tall oil. Vegetable oil is the dominant segment of the market, as the availability of vegetable oil is much higher than that of tall oil. The most common phytosterols found in vegetable oils are beta-sitosterol, campesterol, stigmasterol, and brassicasterol. Each of the vegetable oils found commercially contain phytosterols in different compositions. In terms of type, the sterols market can be divided into campesterol, beta-sitosterol, stigmasterol, brassicasterol, and others. Beta-sitosterol was the leading segment of the global sterols market in 2017 and the trend is projected to continue during the forecast period as well. Beta-sitosterol is present in the maximum amount in vegetable oils as well as tall oils. Increase in the market share of the beta-sitosterol segment can be attributed to high usage of beta-sitosterol in the food & dietary supplements industry. Campesterol, another type of phytosterol, is primarily found in nuts, fruits, legumes, and seeds. Campesterol helps in inhibiting the absorption of cholesterol and thus, it is useful in the treatment of cardiovascular diseases (CVDs). Campesterol is applied in food ingredients, pharmaceuticals, and cosmetics. Based on region, the global sterols market has been divided into North America, Europe, Asia Pacific, Latin America, and Middle East & Africa. In terms of both revenue and volume, Europe dominated the global sterols market in 2017. Germany is a key country of the sterols market in Europe. Spain, Italy, and France are major countries in the region engaged in the manufacture of sterols. They hold a significant share of the market in Europe. North America is another lucrative region in the global sterols market. Increasing demand for sterol powder among manufacturers of functional food and dietary supplements is driving the market for sterols in North America. Abundance of raw materials i.e. vegetable oils, such as corn oil, soybean oil, and rapeseed oil in Asia Pacific is the key factor responsible for large production of sterols in the region. Demand for sterols in Middle East & Africa rose at a moderate pace over the last few years. The trend is expected to continue in the near future also. The sterols market in Latin America is likely to expand at a sluggish pace during the forecast period, due to low demand from various end-user industries in the region. Key players operating in the global sterols market are focusing on capacity expansion and mergers. This, in turn, is likely to propel the global market during the forecast period. The number of players, especially small- and medium-scale manufacturers, operating in the global sterols market is significantly large. Therefore, the market is highly fragmented. Key manufacturers operating in the global sterols market are BASF SE, Cargill Incorporated, The Archer Daniels Midland Company, Raisio Plc., Arboris LLC, ConnOils LLC, Vitae Caps S.A., Lipofoods SLU (Lubrizol Company), Xi'an Healthful Biotechnology Co., Ltd., Matrix Fine Sciences Pvt. Ltd., Fairchem Specialty Limited, and Advanced Organic Materials, S.A.
Plant sterols, known commonly as phytosterols, are plant-derived compounds that are structurally related to cholesterol. Commercially, phytosterols are obtained from vegetable oils and tall oils. These oils undergo different purification processes so as to yield a pure form of phytosterols. Phytosterols present in vegetable oils are of different compositions; however, the key ones include beta-sitosterol, stigmasterol, campesterol, and brassicasterol. Phytosterols are used in industries such as food, cosmetics, pharmaceuticals, and dietary supplements/nutraceuticals. Furthermore, sterols are primarily used in dairy products, sauces and dressings, beverages, bakery and confectionery, meat products, and breakfast cereals in the food industry. There exist various recommendations and rules regarding usage of phytosterols. Phytosterols are primarily used by patients with cardiovascular diseases. About 33% of the global population suffers from cardiovascular diseases; therefore, government bodies are also recommending guidelines and regulations to use plant sterols or plant sterols to reduce the risk of coronary heart diseases. The Food and Drug Administration (FDA) has approved a health claim on phytosterols, which states, 'Foods containing at least 0.65 gram per serving of vegetable oil plant sterol esters, eaten twice a day with meals for a total daily intake of at least 1.3 grams, as a part of a diet low in saturated fat and cholesterol, may reduce the risk of heart diseases.” In the U.S., a variety of vegetable oil- and tall oil-based phytosterol ingredients are considered as Generally Recognized as Safe (GRAS) and they are used in a variety of food products. Their typical usage level ranges from 0.6 to 1.1 grams/serving. Phytosterols are permitted for the use in functional food ingredients in Canada. In terms of volume, Europe dominated the global sterols market. The region accounted for market share of more than 35% in 2017. Germany is a key country of the market in Europe. Spain, Italy, and France are major countries in Europe engaged in the manufacture of sterols. They hold a significant share of the market in the region. North America is another lucrative region of the global sterols market. Increasing demand for sterol powder among functional food and dietary supplement manufactures is boosting the sterols market. Asia Pacific is the major region of the sterols market. Abundance of raw materials i.e. vegetable oils, such as corn oil, soybean oil, rapeseed oil, and other vegetable oils is a key factor boosting the production of sterols in the region. The report analyzes and forecasts the sterols market at the global and regional levels. The market has been projected in terms of volume (tons) and value (US$ Mn) for the period from 2018 to 2026. The study includes drivers and restraints of the global sterols market. It also encompasses the anticipated impact these drivers and restraints on the demand for sterols during the forecast period. The report highlights opportunities in the market at global and regional levels. The report comprises detailed value chain analysis, which provides a comprehensive view of the global sterols market. The Porter’s Five Forces model for the sterols market has also been included to help understand the competition landscape of the market. The study encompasses market attractiveness analysis, wherein raw material, type, and application segments have been benchmarked based on their market size, growth rate, and general attractiveness. The study provides a decisive view of the global sterols market by segmenting it in terms of raw material, type, application, and region. These segments have been analyzed based on the present and future trends. Regional segmentation includes the current and forecast demand for sterols in North America, Europe, Asia Pacific, Latin America, and Middle East & Africa. The report also covers individual application segments of the market in every region. The study encompasses profiles of major companies operating in the global sterols market. 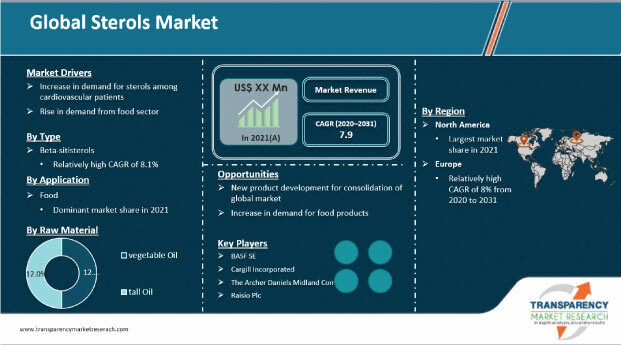 Key players profiled in the report on the global sterols market include BASF SE, Cargill Incorporated, The Archer Daniels Midland Company, and Raisio Plc., Arboris LLC, ConnOils LLC, Vitae Caps S.A., Lipofoods SLU (Lubrizol Company), Xi'an Healthful Biotechnology Co., Ltd., Matrix Fine Sciences Pvt. Ltd., Fairchem Specialty Limited, and Advanced Organic Materials, S.A. Market leaders engage in strategic pricing and product improvement to increase their profit margins. The report provides size (in terms of volume and value) of the global sterols market for the base year 2017 and forecast for the period between 2018 and 2026. Market numbers have been estimated based on raw material, type, application, and regional segments. Market size and forecast for each raw material, type, and application segment have been provided for the global and regional markets.